Corobrik’s Onyx Satin face brick was used in an inspired design to create an ecologically, socially and economically sustainable flagship building for the I-CAT Environmental Solutions in Pretoria. Mirroring I-CAT Environmental Solutions’ principles of ecological sustainability, its flagship Pretoria-based building was constructed using only environmentally-aligned products, among them, Corobrik’s range of face bricks. I-CAT is a leading environmental management company which supplies products and services to assist companies in environmental compliance. Contracted by JC Van der Linder & Venter Projects (Pty) Ltd, the two-story office building has become an iconic structure forming part of the N4 Gateway Industrial Park since late 2015. Some 50 000 of Corobrik’s Onyx Satin face bricks were chosen for the project. 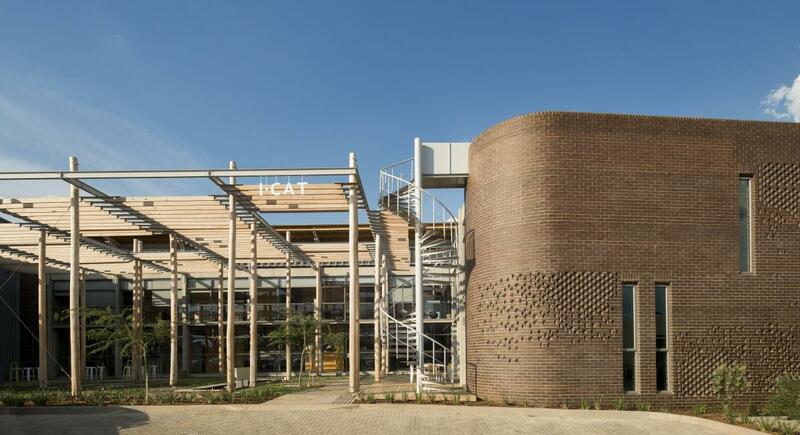 Explaining the thought behind the clever design, Braam de Villiers of Earthworld Architects said that the brief was to reflect I-CAT’s ecologically sustainable ethos which they translated into a building that is sustainable on all three levels; ecological, socially and economical. De Villiers said several active and passive design systems were incorporated to meet the sustainable ideals. Passive systems included orientation, shading, natural ventilation and lighting to improve the comfort for workers. This thermal management is further enhanced by the clay brick which – through its inherent thermal efficiency – regulates heat in summer and coldness in winter for increased comfort. Another added benefit is the cost saved on artificial heating and cooling systems. The low maintenance properties of face brick were also an important determining factor, as this saves on future costs while further preserving energy. “The monolithic face brick wall creates a bold street façade which is broken up with a punched steel window frame and by special bricks that create an integrated woven fabric to specific areas,” said de Villiers, expanding on the brickwork design.